Note: Elastic Beanstalk supports Ruby 2.3. They seem to be behind one major version for stability. Application rails5app has been created. It appears you are using Ruby. Is this correct? We need to configure the SECRET_KEY_BASE. Creating application version archive "app-4801-170728_225019". 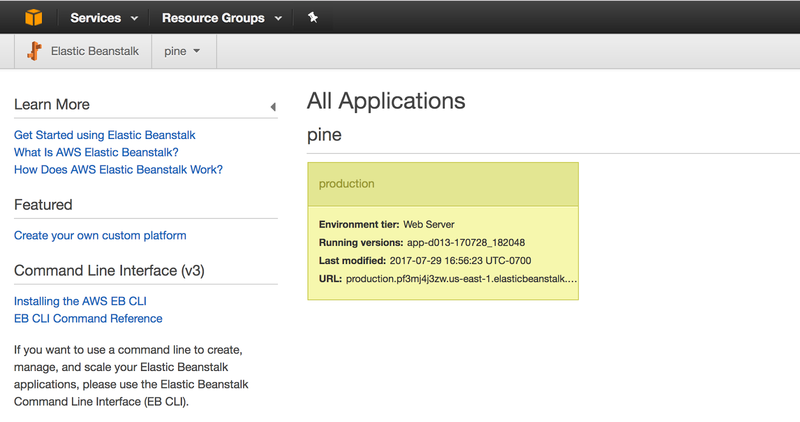 Uploading pine/app-4801-170728_225019.zip to S3. This may take a while. ERROR: Environment named production is in an invalid state for this operation. Must be Ready. I ran eb logs which seemed to hang (maybe it was downloading a zip file, only God knows because there is no feedback). The cause of this problem was that I had created the Postgres database using CLI and by default it was in VPC. So it was not accessible to the external Rails app. 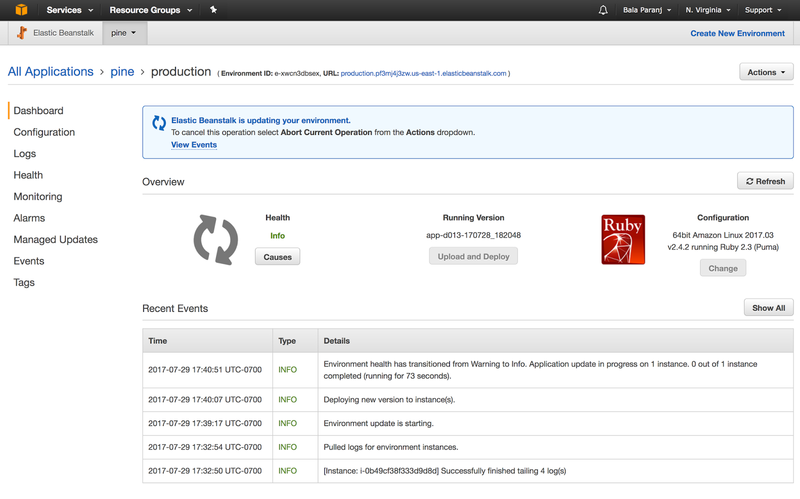 I had to create another RDS instance using the AWS console browser GUI. Now the status went from red to yellow. This must be installed for Postgres database to work. Commit the change to git and deploy. The application will be now be uploaded to Beanstalk. Creating application version archive "app-4801-170728_225337". Uploading pine/app-4801-170728_225337.zip to S3. This may take a while. INFO: Deploying new version to instance(s). -- Events -- (safe to Ctrl+C) Use "eb abort" to cancel the command. The eb status may say ready, but the GUI still shows as the update is in progress. to open the Rails app in the browser. 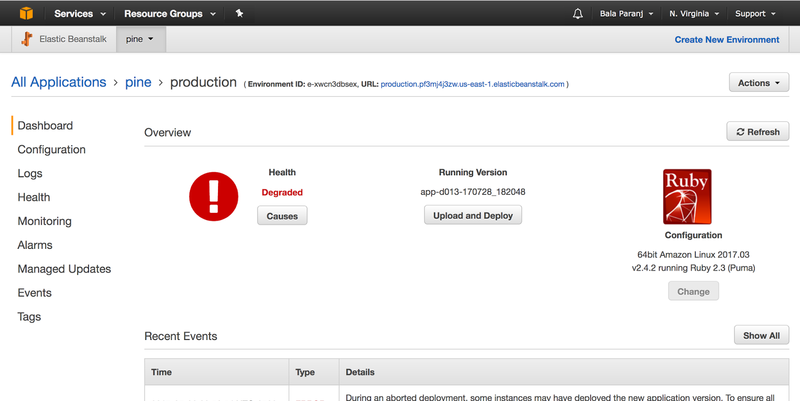 You will be able to see the status ok at elastic-url-opened-by-the-command/health/index. You can view bigger screenshots here.